Mixing larger and smaller tiles creates a retro style. Two-inch hex tiles form a black-dot mosaic pattern, providing contrast to the subway tiles. During a bathroom renovation, it’s not uncommon to encounter a few minor obstacles. When the reno is on the second floor of a three-storey house built in 1906, the list of unexpected hurdles can quickly escalate. Luckily, a few select design choices can remedy many of these "hard-to-fix" issues and still look fantastic once implemented. With framing accomplished, the electrical run, the rough plumbing in place and the drywalling, taping and mudding stages completed — the first coat of paint on the ceilings and walls really begins to reveal the light at the end of the tunnel, six weeks into a two-month, 150-square-foot six-piece bathroom renovation/expansion. And although the walls have been made plumb and level, the subfloor of an old house is at the mercy of the joists’ integrity below. At this job site, the floors tend to sink considerably as you move away from the exterior walls, as though the old two-by-eight joists had bowed over time under the weight of each floor — a lingering issue. The planned bathroom expansion combines two existing rooms, each revealing a 1½-inch, inconsistently fluctuating grade discrepancy, from the exterior wall to the opposing interior wall(s). Because part of the design includes heated flooring, which requires leveller to hide the heating coils once laid out on the floor, the process of pouring the leveller would become an exercise in strategy, broken into two separate steps. Furthermore, it would be impossible to create an adequately level surface on which large floor tiles could be installed — the subfloor was just too wavy, with too much variation in grade. What to do in this instance? 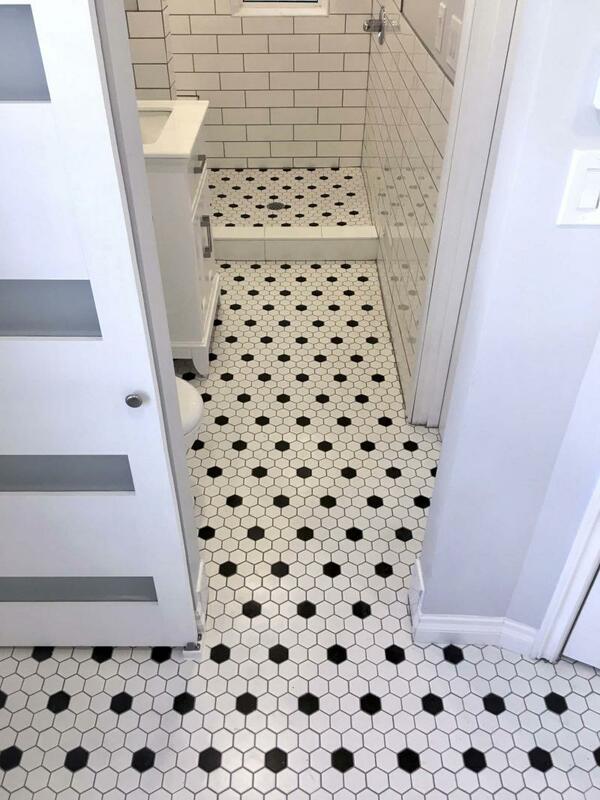 Thankfully, in keeping with the esthetics of the era, a two-inch hex mosaic tile was chosen to eliminate any subfloor idiosyncrasy concerns. Normally, a small-tile mosaic is the tile of choice for a walk-in shower floor, as this tile easily follows the contours of a shower pan graded to a centre drain from all sides. This same mosaic throughout the bathroom would now compensate for imperfections along the subfloor, virtually hiding any slight peaks and valleys that may not be eliminated by leveller, especially closest to the exterior walls. The old subfloor was first prepped with a quarter-inch plywood throughout, to provide a smooth integral surface on which the heating coil could be installed, and onto which the leveller would eventually be poured. To control the leveller’s path, it was initially mixed quite thick for a strategic spread, as it became quickly evident where the subfloor presented dips and low areas. To the best of my ability, most of the heating coils were covered during this first pour. The next day, any remaining coils were coated during a second pour, mixed to a more fluid consistency, to ensure that the coils not covered during the initial pour were completely submerged under the second coat of leveller. The second pour was allowed to set and the tiling began the following morning. A four-by-12-inch, white subway tile was chosen for the shower stall, shoulder-high walls in the smaller room, tub walls and backsplash for the main vanity. A larger 12-by-24-inch white tile was used for the shower bench-top, tub-top surface and baseboard (split in half along the length of the tile) wherever the subway tile was installed above the floor. 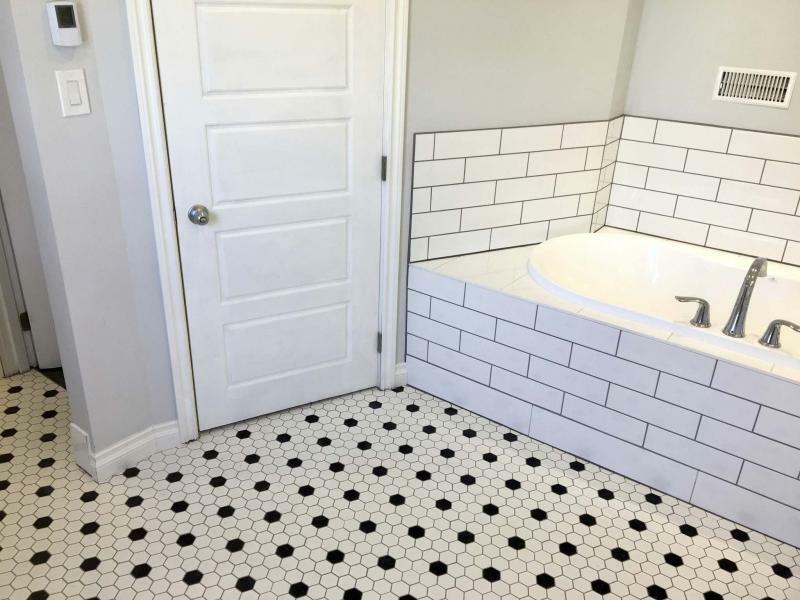 By using the larger tile as baseboard, each section was precisely cut to compensate for any flooring height discrepancies, below the level line of the lowest row of subway tile. Wherever the large white tile was installed, a white grout was used to make the surface appear solid and congruous. Everywhere else, a mid-tone grey grout would be applied. Once the wall tile was completed, as well as the larger white tile in specified areas, the two-inch white-hex with black-dot mosaic tile was first installed on the shower pan floor, whereby the tile is cut to fit perfectly around the stainless-steel drain. The mosaic was then installed along the main floor, working backwards from the shower area, past the entryway into the larger room in keeping with the same depth of tiles all the way to the back wall. By doing this, I could work my way back towards the angled wall and doorway adjacent to the tub area. It was very important to maintain as straight a line as possible throughout the two rooms, as the black dots would reveal any deviations. Once the floor tile had set and the grey grout was applied the next day, the entire bathroom expansion floor feels solid and looks fantastic, despite its grade and level discrepancies throughout. White MDF baseboards were installed in the larger room where needed, and the caulking and silicone steps were then achieved before the entire space was populated. Within a few more days, the entire space was ready for use. Large floor tiles in this application would have been very challenging. The small hex-mosaic tile pattern that was chosen not only caters to the retro time period of the house, it also provides a creative solution to the badly bowed subfloor (and joists below). And although the leveller minimized the subfloor’s wavy disposition, the mosaic tile steals the show by camouflaging any imperfections with its hypnotic beauty. A ton of tiling and grouting — well worth it in the end.